MailVault archives email from all standard email servers. It even works without a mail server. MailVault offers a central email backup for everybody and allows you to restore email at will. For any user, any email id and over any time-range. Use powerful search-criteria or simply perform a free-text search through entire message bodies (and some types of attachments) to find what you seek. Discoverconversations and locate that elusive message in your email hay stack instantly. MailVault’s email deduplication gives you single-instance storage, along with compression for a super-efficient and minimal usage of disk space. Administrator’s will love MailVault’s convenience features like web-based administration for easy remote access, bulk-user addition with auto-account activation, single-sign-on support, integration with Active Directory & LDAP and automatic-updates. System alerts keep you informed without having to constantly monitor MailVault. End users will appreciate the simple web-based interface and self-service options for search and restore of their own email, without needing to rely on expensive helpdesk or administrative resources. Reports and audit trails keep your solution compliance ready and offer business intelligence for email and trends to the management. 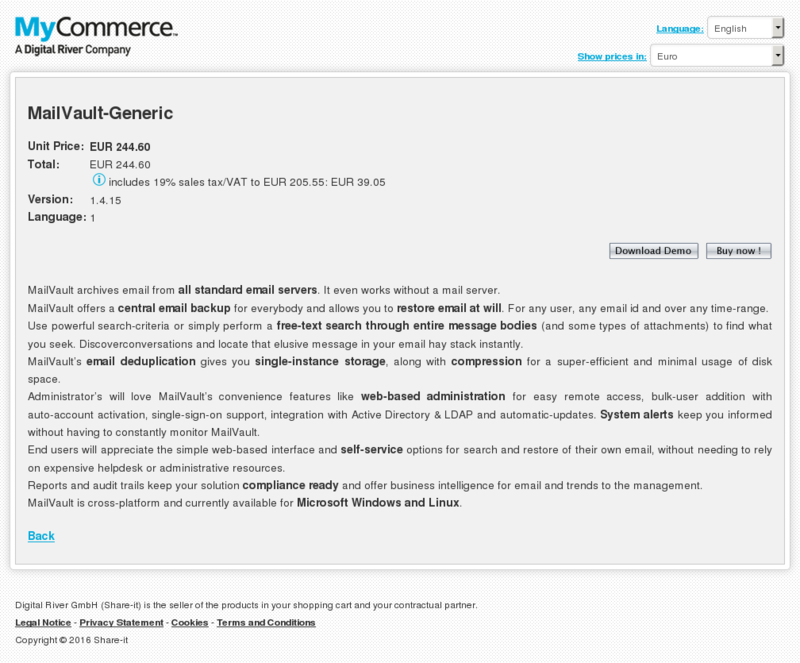 MailVault is cross-platform and currently available for Microsoft Windows and Linux.